Does Crying Make You Healthier? 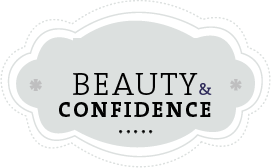 Beauty and Confidence is the definitive guide to beauty, make-up, wellness, and healthy looking skin. 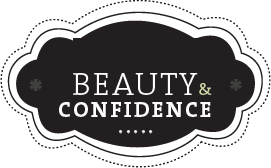 Our Editorial focus brings the reader tips and ideas on how to use beauty products to bring out your natural beauty while keeping your face feeling energized and looking young and healthy. All too often, I catch glimpses of women with unknowingly smeared lipstick and raccoon-like eye makeup on the street. Hey, it happens -- but it doesn’t have to! 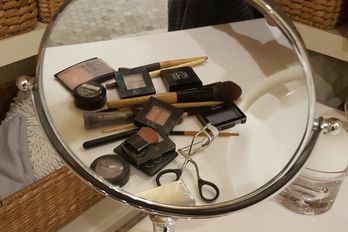 As a makeup artist for Good Morning America, it’s my job to make sure the anchors and reporters look perfect from the show’s start to finish. 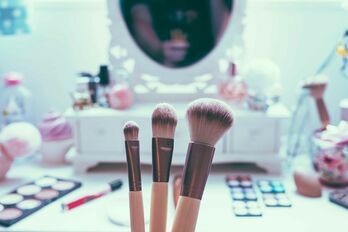 With those hot studio lights and high-pressure scenarios, it’s a challenge to make their makeup smudge- and budge-proof. Over the years, I’ve learned a few tricks that really work. With these following tips, you’ll look flawless for hours. 1. Choose the right foundation. Finding the right foundation that won’t look caked-on after a few hours is essential. The best product depends on your skin type. Experiment with drugstore concealers to find the right one. Sephora-brand concealers are also dependable. They come in a variety of shades for all skin tones and rarely require reapplication throughout the day. I like how they sink into the skin, leaving a nice, natural look. 2. Finish with translucent powder. Television anchors are constantly under bright studio lights. My trick for keeping them shine-free: I use a translucent powder, which leaves skin with a matte finish. I recommend doing a touchup through the course of a day. Use a facial tissue to gently blot the skin and remove excess oil. Then reapply the translucent powder. How often have you looked in the mirror to see smeared mascara or a black under-eye smudge? To prevent this from happening, use waterproof mascara. Some can leave your eyelashes looking brittle or clumpy, so test out a variety of brands. 4. Prime your lids and lips. Creased, smudged eye shadow is one of the biggest beauty blunders I see. But one simple step can prevent this from happening: First, prime your lid with concealer. Without a primer, the makeup has nothing to hold onto -- and the natural oils in your skin will cause it to slide off and crease. So gently dab a little concealer onto your eyelid before applying any eye makeup. You can also use this same trick for your lips. Using a finger, blend your concealer right onto your lips. If you find that this causes your lip color to look too light, try filling in your entire lip with a natural-colored lip liner. Then blot with a facial tissue before slicking on your lipstick. Q. Are there different types of viruses in warm weather? For the most part, viruses are the same year-round. But there is one kind that's more common in the summer: the enterovirus, also called the stomach flu. This virus, which lasts a week or two, causes digestive issues and respiratory symptoms. Because enteroviruses are spread the same way as colds -- through direct contact with another person or an infected surface -- remind your kids to wash their hands often and avoid sharing drinking glasses, eating utensils or water bottles. Q. 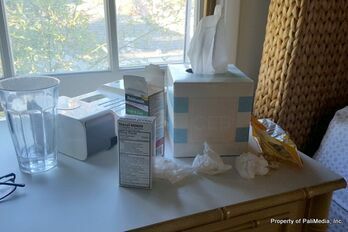 How should I treat a summer cold virus? Don't ask your pediatrician for antibiotics, since they're not useful for viruses. Instead, treat a fever with a pain reliever, like Tylenol. Cough medicine and decongestants can provide relief from cold symptoms. Check the packaging for age restrictions. And if your child is suffering from stomach issues caused by the enterovirus -- and is 6 or older -- you can give her an antacid. Of course, make sure your child gets plenty of rest. You should also ensure she's drinking regularly, since the hot weather ups the risk for dehydration. Cooling baths, light clothing and air-conditioning can also help your little one stay comfortable while she recovers. If one kid in your family is sick, how do you protect the rest of the brood? Do you let him or her play with brothers and sisters? Tell us in the comments below. After a long winter, you’re ready to toss the extra layers. But while the spring brings longer days, you won’t get any color from the five-minute walk from your car to office. Besides, you know that spending too much time in the sun can expose you to harmful UV rays. The solution? Self-tanners are a safer option, and you can apply them at home. Whether you’re a self-tanning pro or novice, our guide will help you achieve an even golden glow without the streaks. Get ready to transform your complexion from ghostly white to a sun-kissed glow. For the self-tanner to set in evenly, your skin should be as fresh as possible. Shave your legs and exfoliate any area that you’re self-tanning, with a liquid exfoliating scrub. Step 2: Apply self-tanner from bottom to top. Wearing latex gloves, gently apply self-tanner onto your skin. Start at your feet and slowly move up your body to avoid awkward positions, and make sure everything goes on smoothly and evenly. Keep a box of facial tissues on hand to wipe away any excess. Step 3: Smooth out streaks. Areas with thinner skin -- your feet, knees, elbows, wrists and ankles -- are susceptible to streaking. Go over these areas carefully to ensure the tan doesn’t look patchy. To avoid streaks on your palms, wipe them down with a tissue after you’re finished. Step 4: Wait and see. You need to give the self-tanner the chance to seep in and do its thing, so avoid showering or sleeping (unless you want streaked sheets) for at least six hours afterward. To avoid getting the product on your clothes, wear a loose, old T-shirt. Once your tanner has set, be sure to moisturize each day. Keeping your skin hydrated will extend the length of that gorgeous glow. Without a doubt, allergies can make you and your little one miserable -- not to mention wipe out your tissue supply. Fortunately, it's possible to reduce the congestion, stress and headaches with the right touch: Massage can relieve these symptoms by improving circulation, lessening anxiety and releasing muscle tension. According to a study in the Journal of Alternative and Complementary Medicine, massage lowers stress hormones like cortisol and stimulates the immune system. 1. Place the tips of your index fingers where the inside corners of your eyebrows meet the bridge of your nose. Use gentle pressure, and either hold until you feel a release or massage in slow, small outward circles. 2. Place the tips of your middle fingers just to the side of your nostrils, at the edge of the cheekbone. Hold with gentle pressure or massage in easy outward circles. 3. With your middle and index fingers, lightly massage temples (outside corners of your brows, above your cheeks) in a circular motion toward your ears. It’s actually an instinctual reaction to rub this point, and for good reason: It melts away pain. 4. Locate the points where your neck muscles meet the base of the back of your skull, and hold with moderate pressure. Press in an upward direction until the muscles release. 5. Squeeze the fleshy part of the hand between the thumb and index finger. The thumb of the squeezing hand should be on the top side of the hand being squeezed. Hold with moderate pressure and then stroke for a few repetitions, gently pulling out (in the direction away from the wrist). 6. Place your index, middle and ring fingers at the tops of your shoulders and hold. If massaging your child (or another adult), you can also gently squeeze the muscle or rub it along the fibers toward the outside of the shoulder (versus upward, toward the neck). For all points, hold or massage for 20 seconds to two minutes or until there is a release. The pressure should feel good -- not acutely painful. One warning: If you or your child has a fever (and congestion from a potential virus or infection), steer clear of massage of any kind, as it increases circulation and could actually worsen the illness. The same goes for inflammation and skin irritations, like a rash.